Late last year I posted a blast for a casting call for the upcoming season of Curvy Girls on NuVo TV. Well it looks like they kept the original cast members and added another hottie to the mix. NUVOtv’s highest-rated original reality series CURVY GIRLS returns to strut its stuff for an exciting second season on Tuesday, June 11 at 10PM ET. Returning to New York City this season with gorgeous plus-size models Denise, Lornalitz, Ivory and Rosie, we follow these curvy girls as they juggle their professional and personal lives and offer an all-access pass into what it is like to be a curvaceous model in a skinny girl world. Multi-talented newcomer Joanne is a force to be reckoned with. The winner of Mo’Nique’s “Fat Chance”, singer-songwriter and American Idol alum is repped by powerhouse agency Wilhelmina Models. She is also a fashion designer with her own jewelry and plus-size clothing lines. 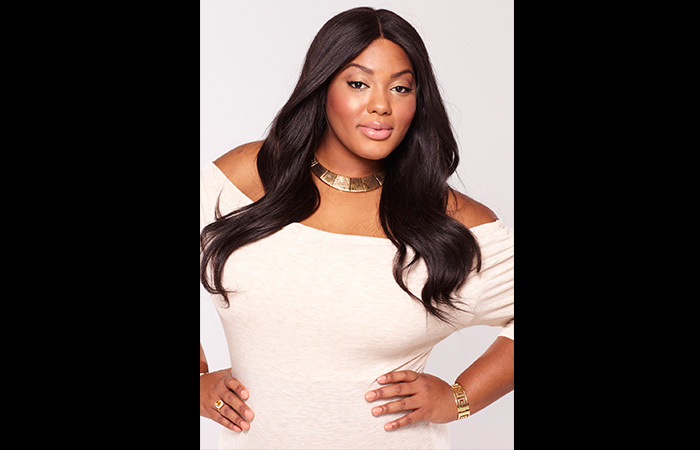 One of the first plus-size beauties to walk the runway of New York Fashion Week, Joanne has also modeled for Ashley Stewart, Macy’s and Nordstrom and has graced several covers of Plus Model Magazine. In an all new twist, the curvy girls welcome special celebrity guests who mentor and guide them and offer up advice and tips on their careers and personal lives. The girl’s heat things up this season and life gets even sexier as the cameras tag along for sizzling photo shoots in amazing locations around the globe including New York, Las Vegas, Puerto Rico and Los Angeles. In season 2 of CURVY GIRLS, NYC gets sexier, more glamorous and filled with all of the drama and chisme the Big Apple can handle! Just when it looked like everything was as smooth as diamonds for the models, things have changed quicker than a fashion trend! Fiery romances are rekindled, baby gossip blossoms, mommy-hood beckons, and a new model joins the crew, turning the fierce factor up to 11! Just like last season, the women can’t seem to control their feisty competitiveness; will they accept the new model as one of their own? Or will they all turn their back on her, adding to the already escalating catty competition? The show will continue to follow each woman’s personal journeys of self-discovery: will Lornalitz finally be lucky in love? What’s the secret from Ivory’s childhood that uncovers a bombshell? Will Denise get her fashion design aspirations off the ground? Has her long-lost father been found? How is Rosie juggling her booming career with motherhood? Will she be able to manage modeling while maintaining her business? Celebrity guests like Perez Hilton, Clark Gable III, Coco Austin, Kimora Lee Simmons and other stars help guide the ladies through Gotham’s celebrity jungle. But will bonding together to confront all-new territory bring the girls closer — or tear their friendship apart at the seams?